With our growing knowledge and understanding of our nutrient requirements, it appears we’ve been making some mistakes. Including a multivitamin in our daily nutritional program is certainly a positive step in the right direction towards improving and maintaining our health. However, current research now indicates that a single, "one a day" style multivitamin tablet, despite its convenience, leaves us unprotected much of the time. As well, the vast majority of multivitamins on the market promote a basic, single, one size fits all formulation, with no regard for our respective age, gender or how active or stressful our current lifestyle may be. 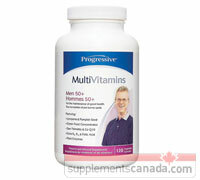 A single multivitamin cannot possibly satisfy all of our varied nutritional needs. Heart Protection - hawthorn and higher potencies of vitamin B6, B12 & folic acid help to reduce blood levels of homocysteine, strengthen heart function and lower the risk of cardiovascular disease. Vitality & Anti-Aging - the green foods alfalfa, spirulina, broccoli extract, chlorella, kelp and green tea extract assist in keeping your body fully charged with a variety of energy producing, highly protective nutrients. Hormonal Production - each formula contains an herbal base that assists in balancing and maintaining more youthful hormone levels. Vision Support - glutathione along with additional vitamin A, C and beta carotene, as well as the inclusion of bilberry extract in the herbal base, all contribute to the support and maintenance of healthy eyesight, including inhibiting the formation of cataracts. Blood Pressure and Cholesterol - coenzyme Q10, niacin, choline, inositol, bioflavonoids and green tea extract all help to lower and regulate both blood pressure and cholesterol levels. Bone Loss & Osteoporosis - essential for mature women, highly absorbable calcium is balanced with additional magnesium to maintain and improve bone density. Prostate Function - the men’s formula contains extracts from saw palmetto and pumpkin seed which along with lycopene form a trio of nutrients that protect and support prostate function.